The Amish Fifth Avenue Office Credenza is an upscale heirloom quality piece that will withstand years of use. Choose from solid Oak Wood, Cherry Wood, Walnut Wood, Hard Maple Wood, Quarter Sawn White Oak Wood, Hickory Wood or Rustic Hickory Wood on this beautiful Amish Credenza. Our Fifth Avenue Credenza is an upscale look that comes with fluted accents, dentil moulding, raised panels, brass hardware and long-lasting quality that will withstand years of use. This beautiful Amish Office Credenza is made of solid wood. 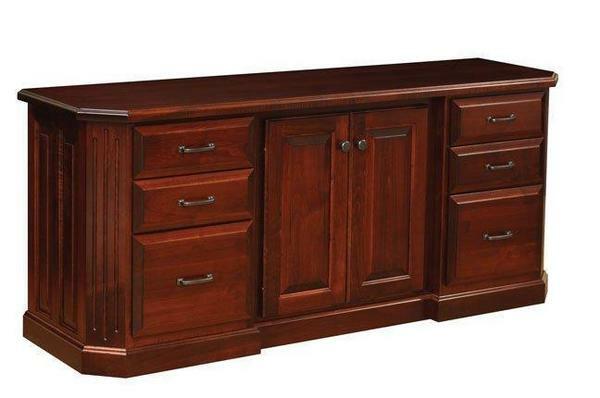 Choose from nine different woods types and a variety of stain options on this Amish Credenza. The Credenza drawers are dovetailed with full extension slides that have a weight capacity of 100 pounds. The Credenza file cabinet drawer bottoms are solid oak plywood and the panel sides are raised.